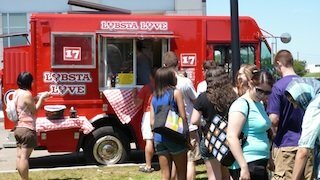 Boston's Food Trucks Specialties | Lobster, Cupcakes, Chowder, BBQ, More! 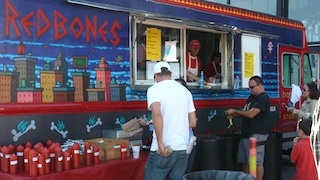 Bon Me, Roxy's Grilled Cheese, Red Bones, Mei Mei Street Kitchen, Taco Truck . 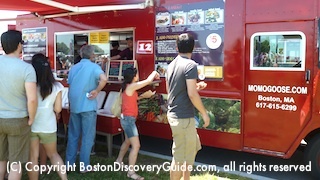 . . Boston's food trucks span a lot of cuisines, and each has its own set of avid fans. 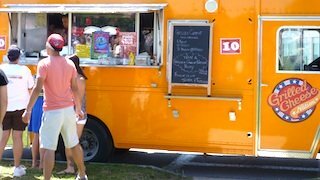 With more than 20 different food truck locations scattered across the city, you'll have the chance to sample the best cuisine from many of them. 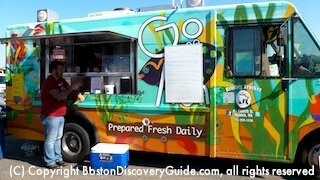 Use our Guide to Boston Food Trucks to discover the type of cuisine to expect from each truck - and then find out about specialties that you won't want to miss. 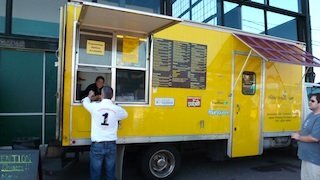 Remember, most food trucks occupy different sites every day, usually for only one meal period (breakfast, lunch, dinner) at each location - so we'll also tell you how to keep in touch with your favorites. 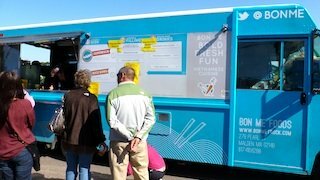 Be sure to use our food truck map and guide to locations to find your favorites. You'll be glad you did! Vietnamese-inspired cuisine with a little French influence, made with the freshest New England ingredients. Choose a sandwich, noodle salad, or rice bowl, and layer on spicy chicken, BBQ pork, or tofu and shiitake mushroom filling. Two must-try treats: deviled tea eggs and classic Vietnamese iced coffee. Make that three - you shouldn't miss the banh mi sandwiches! 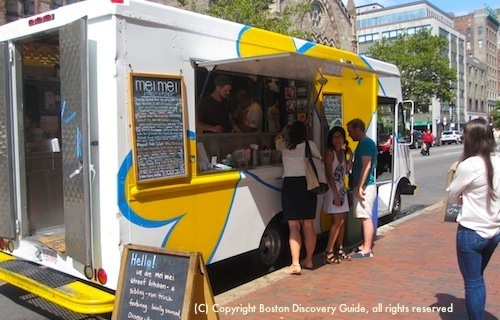 Look for Bon Me's trucks around Boston and at SoWa Open Market - and go visit them at their new restaurant at One Kendall Square in Cambridge. Lobsta Love - Lobster & More! Lobsta Love - the name says it all! I always get the lobster roll but others rave about the clam chowder, lobster mac 'n cheese, and Asian crab rolls. To be good, lobster needs to be absolutely fresh...and Lobsta Love's is. What can I say...I love it. You will too! The gourmet Southeast Asian food served by Momogoose includes an array of favorites - Korean bulgogi and BBQ, Vietnamese pho and rice paper wraps, Thai peanut sauce and tofu, Chinese wontons, Japanese ramen soups - and you can mix and match however you please. Vegans and vegetarians will find plenty of options too. 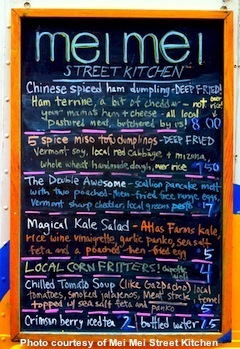 Look for Momogoose around Boston, near MIT/Kendall Square in Cambridge and SoWa Open Market. What is it about grilled cheese that's so satisfying? Head over to the Grilled Cheese Nation truck for comfort classics featuring different types of cheese - cheddar, gouda, brie, and blue - paired with organic artisan breads and tasty gourmet spreads. Pair your sandwich with tomato soup (gazpacho in the summer) - or indulge in nutella, fluff, and banana slices on brioche. Life is good! 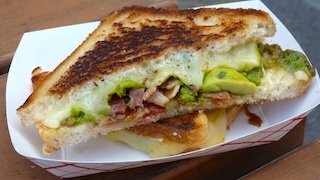 Look for Grilled Cheese Nation around Boston (often the Greenway), at Harvard in Cambridge, at local food truck festivals, and SoWa Open Market. Roxy's Grilled Cheese features innovative riffs on the classics. That's Roxy's mouth-watering Green Meunster in the photo to the left, and yes, it tastes as good as it looks! Another must-try is the Mighty Rib Melt - fontina, braised short ribs, and caramelized onions. They make everything fresh - nothing comes from a package. You get to savor the goodness. 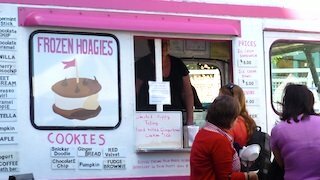 Look for Roxy's around Boston, at local food truck festivals, and SoWa Open Market. Confession: I've become a Mei Mei Street Kitchen groupie - I'm addicted to their cold sesame noodles, their shredded kale salads, everything they do with tofu. And don't get me started about their yummy dumplings! Also love how they source their supplies from small local farms near Boston and focus on seasonal harvest - and how the menu changes daily, based on what's fresh and available. 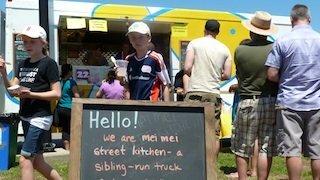 Check out Mei Mei Street Kitchen's blog to get a taste of what's on offer. The Dining Car specializes in mouth-watering gourmet sandwiches with global touches (try the house-marinated goat cheese sandwich with honey truffled walnuts and fresh greens), yummy focaccia baked right in the truck, soups, and salads featuring local seasonal produce. 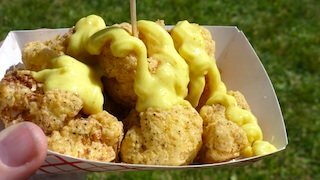 But take my advice - do NOT pass up a chance to try the Crispy Cauliflower - addictively delicious! 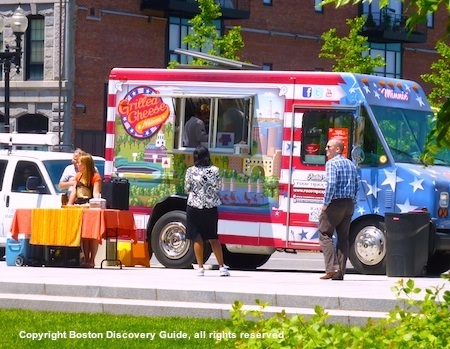 Look for The Dining Car around Boston, at local food truck festivals, and SoWa Open Market. Redbones restaurant in Somerville's Davis Square is a long-time favorite, and now you can get their Southern BBC including succulent ribs, pulled pork, and wood-grilled chicken straight from the Redbones food truck - doesn't get better than this! Be sure to include some sides - candied yams, greens, garlic mashed potatoes. 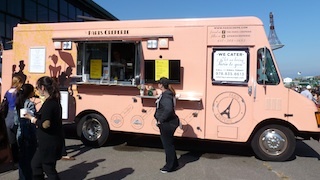 Paris Creperie's "la Tour Eiffel" is Boston's first crepe truck, and attracts large crowds of fans wherever it goes. Don't miss the sublime crepes with nutella and fruit. Best of all, if you get intense crepe cravings during the winter when the truck vacations in warmer climes, you can head over to Paris Creperie in Brookline's Coolidge Corner (278 Harvard Street). The Chubby Chickpea serves up delectible Middle Eastern fast food - crispy falafel, creamy hummus, house-crafted shwarma, smoky babaganoush, and lots more. Choose from sandwiches, salads, and entree-sized meals. Look for Chubby Chickpea around BU, the Financial District, Back Bay, food truck festivals, and other special events. Go Fish presents a dilemma: you'll want to try everything on the menu. Start with the crispy smoked cod and chorizo cake sliders with chipotle mayo and pickled onions...next time, try the miso-seared salmon rice paper wrap with Asian greens and ginger/wasabi sauce...another time, pair the creamy clam chowder with fish and chips. That's only a small part of the creative menu...but now I'm too hungry to continue writing. Gotta go find a food truck! Boston Super Dog - Boston's best hotdogs! Look for them at city locations, and at SoWa Open Market. Sweet Tomatoes Pizza Truck - Weekly and daily specials add zest, but you can't go wrong with a slice of Pesto Splash - addictively good pesto, mozzerella, and of course, sweet tomatoes on top. Order salad as a side - or add chicken slices to make a meal. Look for them at BU East, next to the Boston Public Library, and in the Financial District. Captain Marden's Cod Squad - Known for their high-quality seafood (walk around Boston enought, and you'll see their truck discretely pull up behind any number of high-end restaurants), Captain Marden's Cod Squad brings an array of seafood goodies: lobster rolls, chowder, fried clams, fish and chips, and more. Look for them in Back Bay and at special events. Clover - Mostly local organic seasonal ingredients (this is hard to do in New England, if you want to eat during the winter) - and the menu changes daily. Think of it as healthy fast food - great flavor, made from scratch, good for you! Look for them at private sites (no longer parking on city streets) all over Boston and Cambridge. Kick*ss Cupcakes - A sweet ending for your food truck meal. Look for them around Boston, at local food truck festivals, and SoWa Open Market. 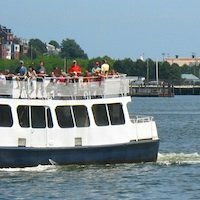 Dine Out Boston - Twice a year, Boston's best restaurants go on sale...don't miss this opportunity to dine for less!